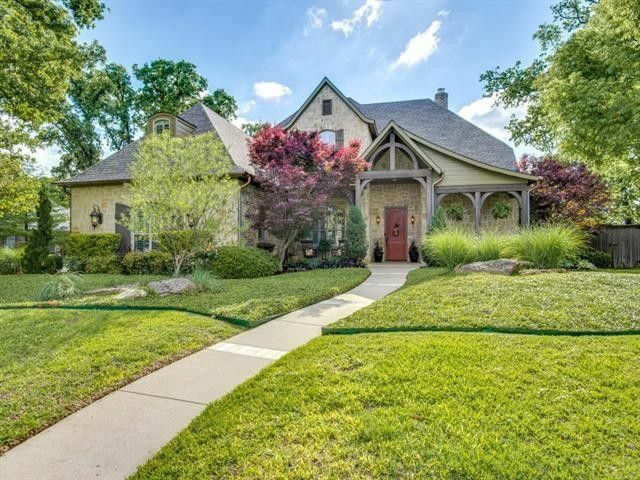 Enjoy comfort & elegance in this Thistle Hills Est. custom luxury home! With stunning wood & tile floors, Plantation Shuttered windows & a private 600 sq.ft. outdoor living room & pergola kitchen, this home is like no other! The 16'X14' French Country kitchen boasts tea-stained cabinets, granite countertops, island, brick-arched gas cooktop, 2 convection ovens, Subzero refrigerator, ample cabinet space & a big walk-in pantry. The open floorplan integrates the family room, formal dining & big breakfast area. The secluded master ste offers a posh bath--2 vanities, honed travertine countertops, jettub, & big shower.The first floor guest suite, upstairs bedrm & media-gameroom add to easy living. Exceptional storage! Directions: From Teasley Lane (FM 2181), turn right onto Ryan Road; turn left onto Andrew Ave. Right onto Maggies Meadow, home is on the right. Exclusions: Oversized 3-car garage has epoxy floors, custom cabinets, shop space. EXCLUSIONS ON SEPARATE SHEET IN MEDIA.